"A rich trifle is made with pound cake, sherry and custard layered in a bowl and topped with a lightly sweetened whipped cream. This trifle is the special recipe from my grandmother and has been perfected over the years by other family members as well. It is a must have dessert during the holiday season. Make a huge batch, serve and if you don’t eat it all, stick it in the fridge and it tastes even better the second day!" Pour the milk into a microwave proof pitcher, and cook in the microwave on high until the milk begins to simmer, 4 to 5 minutes depending on the microwave. Meanwhile, whisk the eggs together with 1/4 cup sugar in a large bowl. Once the milk is hot, slowly drizzle into the eggs while whisking until all of the milk has been incorporated. Scrape the custard into a saucepan. Cook over medium heat, stirring frequently, until the custard has thickened enough to coat the back of a metal spoon, about 5 minutes. Pour the custard into a bowl, cover with plastic wrap, and refrigerate several hours until cold. Whip the cream with the remaining 2 tablespoons of sugar to firm peaks; set aside. Line the bottom and sides of a trifle bowl with half of the pound cake slices. Drizzle the pound cake slices with half of the sherry. 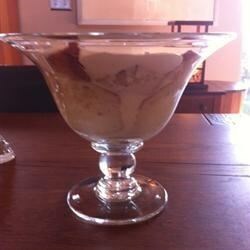 Pour 1/3 of the cold custard into the trifle dish and smooth the top. Repeat to make two more layers of pound cake, sherry, and custard. Top with whipped cream. Cover the dish with plastic wrap, and refrigerate at least 2 hours before serving to allow the flavors to blend. Absolutely delicious, it's just missing one final ingredient, but I don't know what it is... Apart from that, it's the BEST!!!! !